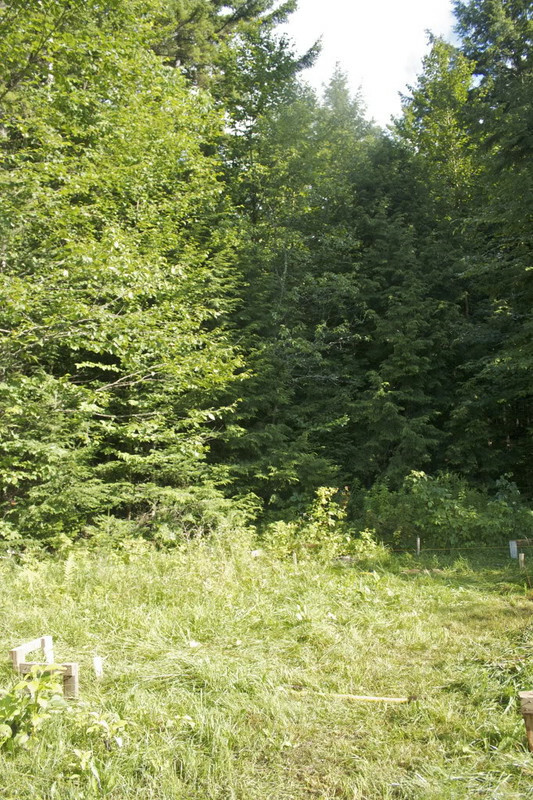 Hi all - I've been lurking on this site for a few months now, ever since we purchased some land in Vermont. 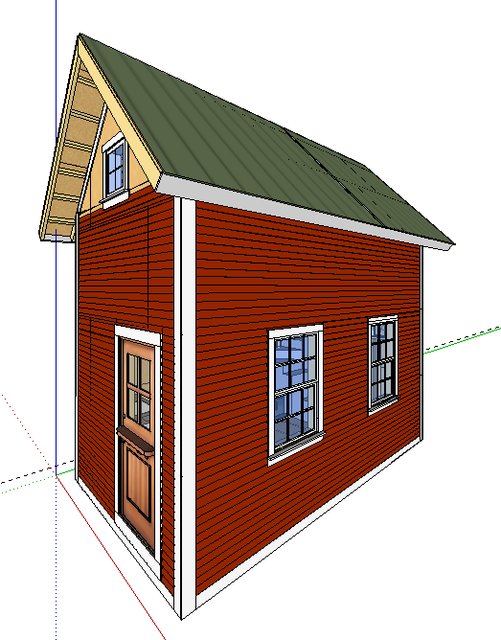 We're hoping to eventually build a house there, but first we wish to build a 10 x 16 shed with a loft (12 foot walls, 12/12 roof pitch, 2 x 6 studs). Due to time and money limitations, I'll be happy to get the deck complete before winter. The main stumbling block right now is just what to do for a foundation. I'm looking for a low cost, relatively simple solution that I can do by myself. I've read a lot and have seen many different options and opinions. I'm thinking that a pier and beam solution would work best, where the piers would be precast concrete embedded in crushed stone. 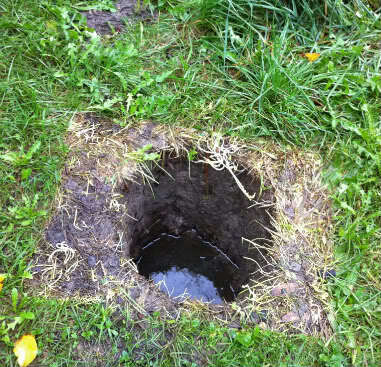 The stone would fill a roughly 12 inch diameter hole, 4 feet deep. There would be 4 piers per beam along the 16 foot length, and 3 4x4 beams for 12 piers in total. I know that ideally I should instead be using a lot of cement and sonotubes, but it seems less practical for the location and my time/labor/cheapness. I've also considered cinderblock piers but that doesn't seem far removed from sonotubes. So, my question is, would my solution be sufficient for this building or am I talking myself into a load of future trouble? Note that in my area there are no building codes nor building inspectors, but I don't want that to be an excuse to be too stupid. Thanks! You could use the PT wood foundation shown near the bottom of the page. It is close to your idea. Notice I have a 16" diameter crushed rock footing called out. If you are in solid soil (well drained gravels) a 12" footing should work, especially with the short spans. You should also check around to see what other small buildings have done for foundations. Here are a few photos of the location. 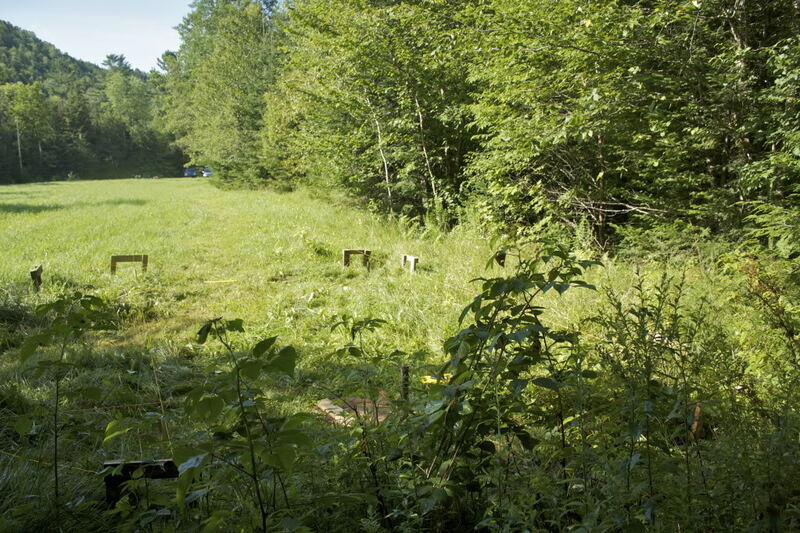 The site for the shed is on the northern end of a ~2 acre pasture, bounded by road, woods and brook. what part of vermont? my daughter just moved to Johnson.. looks like a beautiful spot from the pics! Congratulations. I lurked for years before joining. 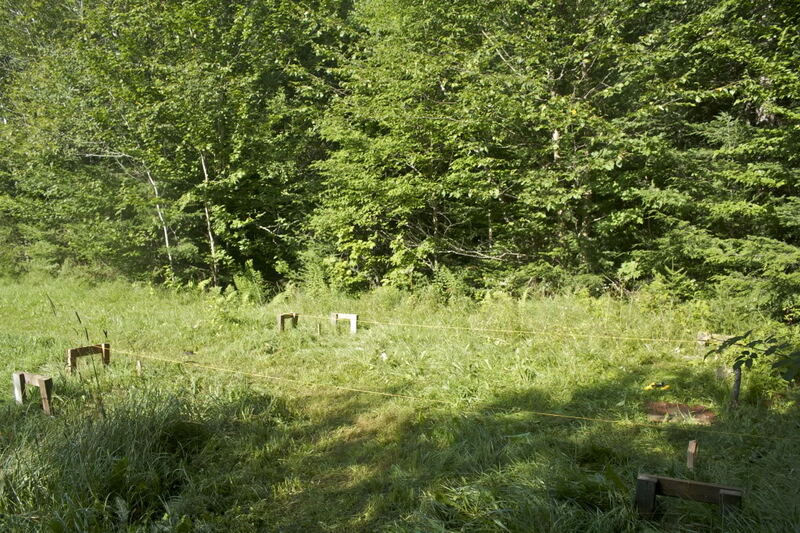 About 7 years ago I bought 7 acres in the NEK of Vermont. I love Vermont . I hope to build something small at first. I'm trying to decide the same thing. Block or piers? . Somedays I think about digging footings and pouring the footing with vertical steel. Then staggering block and filling the block in with concrete. I think mixing the concrete yourself for the sono tubes would be alot of work, I know folks on here have done it. Block you could bring to your site. A concrete truck would be nice but might be pricey and might not be able to get to your building site. This forum is a great place, people always willing to help out. Good luck and have fun whatever you do. I can't wait to watch your proggress. Hi Don - Yes! I've looked over your article many times. You'd be surprised at how quickly it comes up in Google search. It's probably my own self-doubts, but your reference to piers in cold weather areas didn't seem much like an endorsement. I had seen Jan Nikolajsen's Coyote Cottage and how he had used piers, on a relatively shallow depth of crushed stone. That building being in the Cascades, I figured it would work for me too. But, I'm concerned that what may apply there may not in Vermont, where it is probably wetter (except for this year). The PT wood post might be a good alternative, but I'm unsure about the soil (see below). Jerry - I had not seen a PWF before. Very intriguing. Not sure that it suits my situation, as I'm on relatively flat ground and hard-to-describe soil. I honestly can't decide whether it's sandy or clay-y. I have a suspicion that it may be a lot of fill over a previously logged area, given that it's really easy to dig. We need to do a little more research on the history this weekend. Pocono & Pete - we were fortunate to find these 10 acres in Topsham. It's a pretty easy drive from our home in north Mass., but otherwise fairly remote. No cell phone coverage (which we consider a plus right now), and a bit of a drive to groceries. 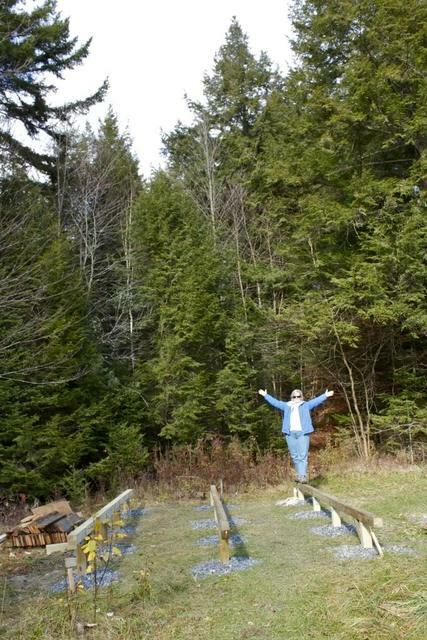 But, should we get to that point and really want it, power & phone lines run along the road that borders the property. I haven't eliminated the possibilty of getting cement delivered - it's just that crushed stone is cheaper and more local. Hey reb! Can't help you with the foundation as I did a crawlspace, but I wanted to reach out as I'm in the process of building a place in VT myself. I'm in the Bellows Falls area - quite a bit south of you. If you think I have any info that might be helpful, feel free to reach out. VT is really a great for nature lovers. My band is playing in mt pillier (spelled wrong) soon. We look forward to the trip . Like others that have posted to this forum, I fashioned a water level to mark and cut all the posts. It worked really well once I got the hang of it, but it would've been easier with help. A couple of things that slowed us down - the lumber yard dropped off 2x8x16's instead of 2x10's. Instead of taking a couple of hours, we decided to use what we had, shortening the width a few inches. I later ripped down some boards and filled in over the 2x8. We'll slap the actual 2x10's on when it warms up. 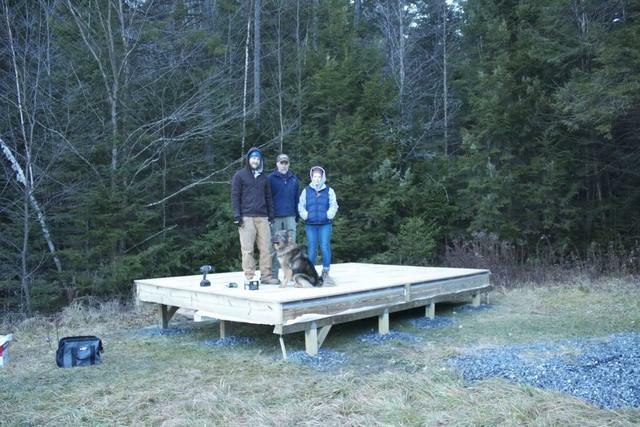 Thanks to my daughter, son and his dog Scoober for helping build on a cold November day. This was last weekend, before an additional foot of snow. Once that all melts, we need to add a lot of cross bracing and some additional hardware cloth underneath. 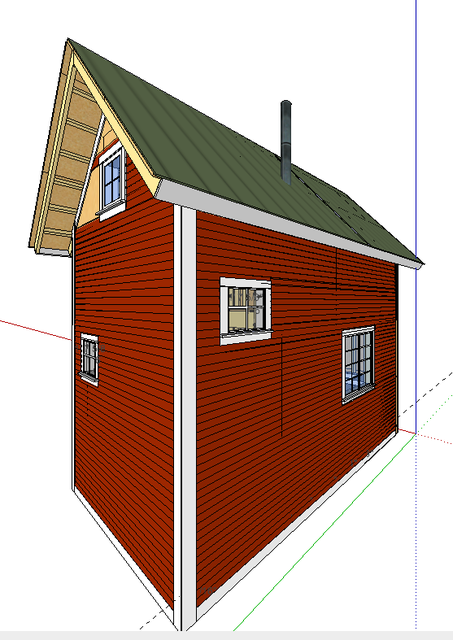 Meanwhile, I've been toiling bravely over Google Sketchup. I had a rough start with it, but I got the hang of it eventually. For those of you who chose to buy Country Plans, you're saving yourself many, many hours of pushing a mouse around, while cursing frequently and loudly. Anyway, here are some screen shots. the design is still in flux a bit. The number of windows and their sizes have changed considerably, and no doubt will continue to. The loft structure and floor will likely change as well. 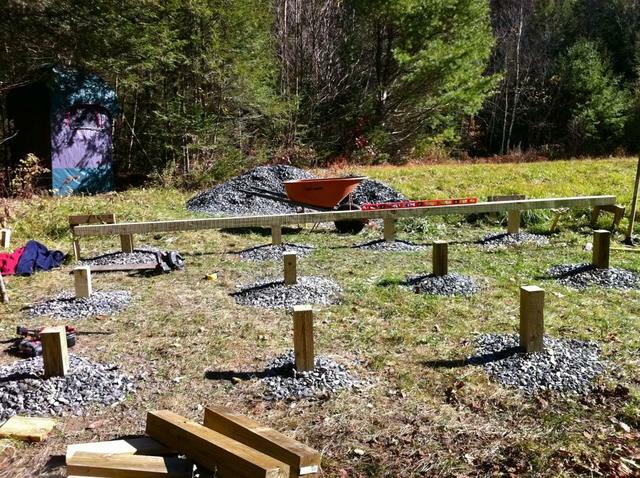 We're hoping to get the frame up before Memorial Day, assuming the snow melts and the mud dries. looks like a great building site reb5maccom! You might consider covering the gravel with local soil to keep water from pooling in your piers. 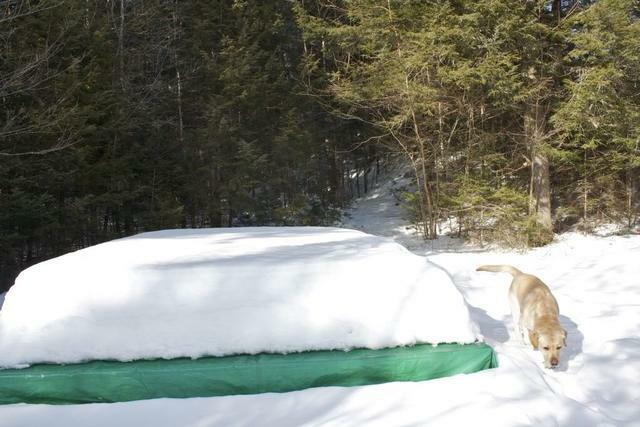 a cabin project on this website had their pier holes pool water and the cabin started falling over! lack of bracing did contribute to the issue though. nice start, Thanks for posting. It did drain nicely, and gave me confidence that I have less to worry about as far as heaving (or toppling!). But one reason I didn't do more than just the platform was to see if any heaving does occur. I left it as quite level, so it should be pretty easy to tell whether or not I need to do some adjustments in a couple months, or so. Microhydro is a definite possibility here. It's not a large stream, but it flows well all year long. It's yet another topic I need learn more about. How deep are the piers? I dug as deep as I could go with the post hole digger - between 3.5 and 4.5 feet, depending on when I hit unmovable rocks. I had to be a little flexible in where all the holes ended up, due to the submerged boulders. 3.5 to 4.5.... deeper than what some have done and that is a plus. I re-read the thread. I like the little bridge. What did you use to suspend it; cable, chain... ? Note that in my area there are no building codes nor building inspectors, but I don't want that to be an excuse to be too stupid. Thanks! I found a Vermont snow load map. It is in the link bel;ow. I see most of Vermont seems to be in the 50 or 60 lbs per square foot category, with some places at 70 lbs. That's a lot of snow. First, I am not an engineer. I do have concerns about the proposed 12 foot tall wall with loft though. It appears there would be approximately 4 feet of upper wall with the rafters resting on the upper wall plate. The roof load plus snow load will create some large forces pushing outwards on those wall tops. I'm reasonably sure that if you were submitting these plans to a building code/inspection department they would not be accepted. Rafter loads come down to the wall and are resolved into a straight down force and a horizontal force. The downward vertical force is placed on the foundation through the wall studs. That is the studs primary function; support the vertical load. The outward force is usually restrained by a rafter tie across the width from one sidewall to another at the rafter/wall connection. Rafter, tie and wall are tied together. The triangle formed is very strong resisting forces to deform it. Without a rafter tie that force will work on spreading the wall tops. I used 60 lbs as a snow load in Don_P's rafter thrust calculator. Rafter forces at the heel joint, where the rafter connects to the wall top, come out at 233 pounds. That is each rafter presses outwards with that force with a 60 lb load of snow. That seems like a lot of force to me. That would provide the necessary restraint to wall spread and some extra interior headroom. You might want to increase the loft wall height to provide sufficient headroom up there. Add collar ties and it would be a sturdy assembly. The rafter sizes might have to be increased with raised ties. If the rafter ties are oversized from minimal requirements they will also provide more room for insulation. 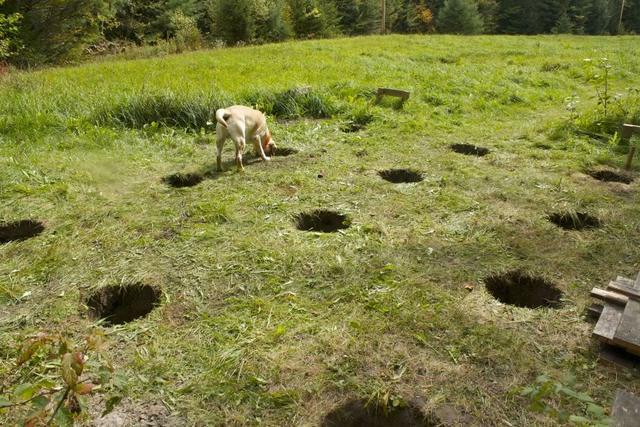 That dog sure digs neat, clean holes. Looks like he kept a pretty good pattern, too. Do you rent him out? Well, like most labs, he's part goat, part dispose-all, and part backhoe. But no, I can only get him to make square holes, darn it. Thanks so much for your expert eye, Don. An old friend of mine who is also an architect had recently recommended collar ties too, as well as gable end beam pockets. 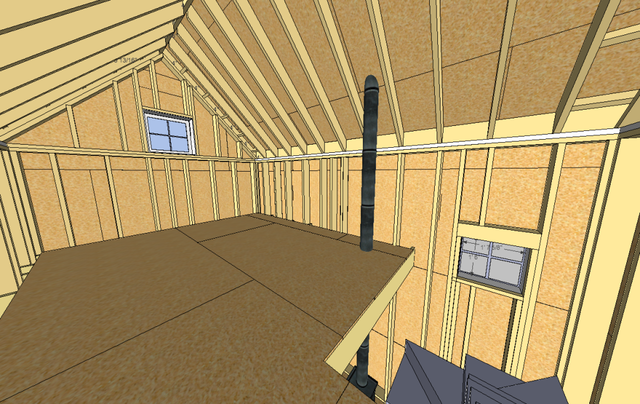 I'll likely use a larger ridge beam than drawn and tie the rafters into it with metal hangers. The design doesn't really allow for rafter ties, but wouldn't the loft joists serve somewhat as rafter ties, even though they're 4 feet below the cap rail? It is only a 10 foot span, afterall. As I mentioned yesterday, I'm considering drastically revising the loft. After seeing the pictures of Victoria's Cottage in Western Maine again in this forum, we're exploring using some hefty beams on inset rim joists. Jeff922's work looks so amazing, though I'm unsure whether it would have any additional anti-wall spread effect. 2)... as well as gable end beam pockets. I'll likely use a larger ridge beam than drawn and tie the rafters into it with metal hangers. 3)... The design doesn't really allow for rafter ties, but wouldn't the loft joists serve somewhat as rafter ties, even though they're 4 feet below the cap rail? 1) Collar ties keep the roof from peeling open/off under conditions of extreme wind. They do little if anything to prevent rafter tail end spread. There seems to be much confusion between collar ties and rafter ties and the purposes they fulfill. You are not alone on that. 2) Gable end pockets or cradles are required to support a true ridgebeam, a structural member. The ridge board is not structural. There is nothing wrong as drawn. The ridge board only really serves as a convenient method to nail one rafter tip to another and to provide proper spacing at the peak. It could be dispensed with and the rafter tips sandwiched with plywood gussets. They would look similar to a truss, be installed similar to a truss, but they would not be trusses. The ridgebeam support does not stop with a pocket in the end wall to hold the ends. There needs to be a path to carry the load down to the foundation. The ridgebeam carries one half the total roof load (one quarter in each sidewall). That requires some sturdy posts in the wall. That path need not be straight down. It may be spread by use of headers and posts to go around windows, doors and other obstacles to a straight down path. The strength values have to be calculated to do this safely. On a small build as this some conservative guessing might be used. At the bottom end that load needs to be adequately supported by the foundation. Your center beam and posts may be up to the task, but I can not say for sure. 3) As drawn/illustrated, in my opinion, not really, although the narrow width may make it work out. As I stated, I'm not an engineer, just working from some aborted training and my gut feeling. And all that is worth what was paid for it. Hmm, you've given me even more to think about it. I guess I need to learn more about structures and such, and soon. From your experience, would using a true structural ridge beam, with all the appropriate gable support, be a decent substitute for rafter ties? Assuming my foundation has enough support, too, as you say. Thanks. Absolutely! A perfect substitute for rafter ties that would otherwise be in the way. It's about framing a cathedral ceiling, which, in a really lame way, is what we've designed. The next question is how beefy to make the ridge beam. Or whether it should be an LVL. Where does one start in order to figure that out? The no brainer method would be to contact a local lumber yard / home center commercial department. Tell them the building size, roof pitch, location. They should be able to tell you what size LVL would be needed. They can also supply paperwork required if you were in a code area. They may or may not be able to advise on how to support the beam as in size of posts, headers etc. Don_P has some experience and knowledge in this. If he can help he will. Understand the information will be unofficial, non stamped, and come with no guarantees of worthfulness and suitability. Worth everything paid for it. Priceless and/or worthless? I ran some rough numbers and came up with a DougFir 7x12. Not sure if I did it right??? And I think a 6x6 DF could carry the load downwards. No guarantee as to suitability or accuracy, no liability accepted, for informational and discussion purposes only.